All the marvelous Malls in UAE have specific area named as SOUQ, which have variety of shops presenting Middle East tradition specially the gold shops sparkling and charm tourists. Sharjah is one of the largest state of UAE has an iconic landmark The Central Souq also known as the Blue Souq was built-in 1978, and was the first infrastructure in the emirate that embodied the idea of a modern shopping centre, and is featured on the Dh5 currency note. 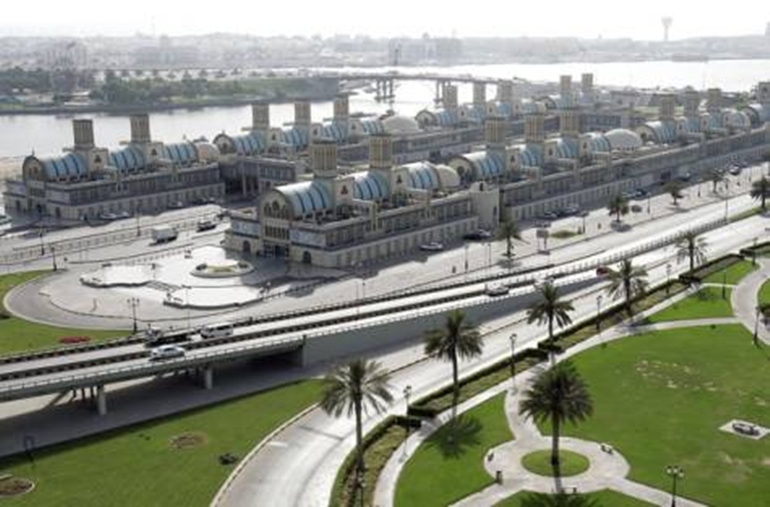 Central Souq is located at the center of the city between King Faisal Road and Khalid Lagoon, and overlooks the picturesque Al Jazeera Park and the Buhaira Corniche. Covering an area of 80 square kilometers, it has 600 shops and its main feature is its intricate design of Arabic architecture— a tranquil spot that still maintains a certain charm since it was constructed over 35 years ago. The ground floor has mostly modern jewelry, watches and clothing, while the little stores upstairs sell a variety of items such as gold and silver jewelry, pashminas, rugs, traditional coffee pots and home ornaments. The popularity of central souq has slowly dwindled over the years. Families no longer visit the souq as part of an outing when visiting Sharjah, and it has become a place that is now only frequented by royal customers or tourists. Mohammad Yasin, the owner of Al Arooj Jewelers, specializes in silver jewelry and has been running the shop since 1980 told that he had many royal customers and they all knew him well because his shop was one of the first to open there. That business was handed down from his ancestors to him; he further added that his son Yunis had no interest in taking over the shop. Yasin was first arrived to the UAE in June 1971, and opened his shop at the Dubai Gold Souq. He told that the rents were always cheaper in Sharjah, so he changed location, at that time the Central Souq was very popular and a good place for business. Vachhani Prakash owned Lata’s handicraft and gift shop on the second floor since 1985, told that mostly Emiratis and tourists visiting his shop, since it has a reputation of providing unique items that cannot be bought elsewhere in shopping centers. Prakash buys his products from all the Eastern countries, such as Morocco, Syria, Egypt and Thailand. He told that most of his products made up of silver and is expensive. Although people have less interest in home decorations but he keep running his business here and considering opening another branch in Dubai. One of the shops that continues to thrive and has a reputation among local residents is the shop of Ayakub Chaudhry, who sells carpets and rugs from Iran, Kashmir and Pakistan. He told that everything is avail there. The architecture of the building provides a certain tranquility that one cannot find anywhere else. People still visit the souq because it is one of the most iconic landmarks in the city of Sharjah. He showed a silk Iranian carpet of 1,000 knots priced at approximately Dh40, 000 that attracts customers. The ground floor of the Souq filled with gold jewelries and fabrics shops. Many of these shops continue to function after 25 years of its launch, and still provide a haven for tourists who seek shelter away from the scorching heat and who are interested in delving into the Arabic theme of architecture. Mervat Mustafa, who has been visiting the souq on a regular basis for the last four years, said that she enjoyed purchasing her items from this area since it was one of the few places where one can still bargain. The souq is not only a hit among mothers with children but among elderly men as well, who buy their dishdashas, gotras and their agaal (men’s clothing) from shopkeepers that they have befriended over the years. Abdul Kadir Mohammad, an Emirati who has been visiting the area for more years than he can remember, told that he enjoyed visiting the souq as it did not seem like a chore but more like an opportunity to visit friends.